CAPE CANAVERAL, Fla.—Two space station astronauts popped in a new pump during a rare Christmas Eve spacewalk Tuesday, eager to wrap up urgent repairs to a cooling system. NASA ordered up the spacewalks to revive a critical cooling loop at the International Space Station. All nonessential equipment had to be turned off when the line conked out on Dec. 11, and many science experiments halted. Mastracchio and Hopkins removed the faulty ammonia pump during Saturday’s outing. On Tuesday, they installed the fresh pump 260 miles above the planet. Standing on the end of the station’s main robotic arm, Hopkins clutched the 780-pound, refrigerator-size pump with both hands as he headed toward its installation spot, and then slid it in. An astronaut working inside, Japan’s Koichi Wakata, gingerly steered the arm and its precious load. “Mike Hopkins taking a special sleigh ride on this Christmas Eve,” Mission Control commentator Rob Navias said as the space station soared over the Pacific. First, the astronauts bolted down the pump, then worked to connect ammonia fluid lines. Last was a series of electrical connectors. Mission Control in Houston was in a festive mood, despite the gravity of the situation. Tabletop Christmas trees, Santa dolls, and red Santa caps decorated the desks. NASA’s only previous Christmas Eve spacewalk occurred in 1999 during a Hubble Space Telescope repair mission. Space station managers considered waiting until January for the repair spacewalks, so an unmanned rocket could blast off with supplies from Virginia. But flight controllers were unable to patch the cooling line by remote control, and the orbiting outpost was considered in too vulnerable a state to put off the spacewalking repairs. The delivery mission was bumped, instead, to January. A bad valve in the ammonia pump caused the breakdown. Another team of spacewalking astronauts installed that pump just three years ago, and engineers are perplexed as to why it didn’t last longer. NASA hopes to salvage it in the years ahead. The 2010 replacement required three spacewalks because of the difficulty in removing the pressurized ammonia lines. This time, NASA reduced the pressure and the task was simplified, allowing the astronauts to get ahead Saturday. Although three spacewalks were scheduled this time around, Mastracchio and Hopkins’s advance work allowed NASA to squeeze everything into two, barring any problems Tuesday. The second spacewalk was supposed to take place Monday, but was delayed a day to give Mastracchio time to switch to another suit. He inadvertently hit a water switch in the air lock at the end of Saturday’s excursion, and a bit of water entered his suit, making it unusable this week. During the rest of the spacewalk, however, the suits remained dry. Last July, an astronaut almost drowned when water from his suit’s cooling system flooded his helmet. Makeshift snorkels and absorbent pads were added to the suits as a precaution. 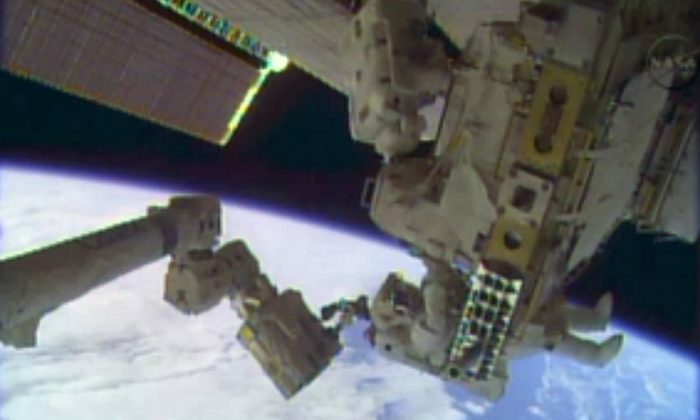 Midway through Tuesday’s spacewalk, no water leakage had been reported.